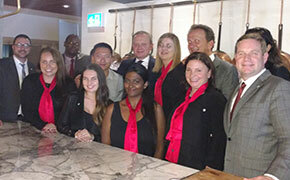 The Trafalgar crew was out in force to network with industry leaders. Lindsay Pearlman, Co-President, Ensemble Travel Group, with TTC CEO Brett Tollman. 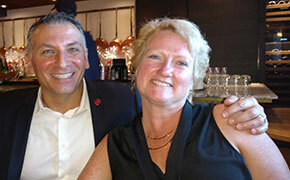 Air Canada Vacations Managing Director Nino Montagnese with Dianne Jackson, CTC, Director, Travel & Retail Product, CAA Club Group. 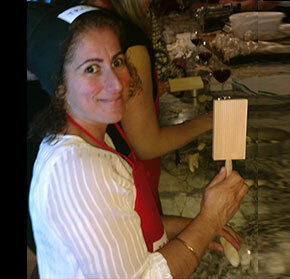 Elizabeth Grundon, Business Analyst, Travelsavers, shows off her pasta-making skills at Toronto's Oretta. It’s always nice to get together with friends and catch up. 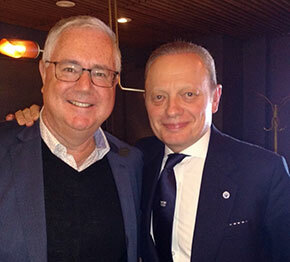 But when Brett Tollman, CEO of The Travel Corporation, came to Toronto last week, there was lots of real news to share as well as the pleasantries of renewed acquaintance. Tollman heads up the organization Forbes recently called “the biggest travel company you’ve never heard of.” They were speaking to a consumer audience of course – Canada’s travel industry is well aware of TTC and its brands including Trafalgar, Insight, Contiki, Uniworld, Lion World, Red Carnation Hotels (and about 20 more). They’re also aware of TTC’s responsibility and sustainability efforts through The Treadright Foundation. On this warm, wet October evening at downtown Toronto’s lovely Oretta Restaurant, where traditional Italian fare is served in a striking art deco atmosphere, a large team from Trafalgar led by Tollman and Wolf Paunic, Trafalgar’s Canadian president, greeted a high-powered group of retail, airline and tourist board leaders. Making it easy for agents was a theme of the Trafalgar presentation. “We want to recognize and enhance the capabilities of our retail partners,” Paunic told Open Jaw. “We are striving to provide as many tools as we can get to the agent to make selling Trafalgar an efficient and lucrative process.” A new agent website and an enhanced TTC Academy for agents with one log-in across all brands are two examples of the initiatives. While maintaining the core essence of what it does, Trafalgar has cleverly managed to add customization, flexibility, dining choice and authentic experiences to its vacations. The company has listened to both guests and the travel professionals who connect to end-users, and made substantive changes. Ten years ago, it would have been hard to imagine any tour operator enabling immediate reviews from guests to appear on its own website with no ability to weed out the negatives. In fact, it’s hard to imagine some operators doing that today. But that’s the approach Trafalgar has taken. In a fascinating extension of crowd-sourcing, Trafalgar’s new brochure features photography and testimonials exclusively from travellers. In terms of providing an authentic experience, this is another step forward. More Definite Departures: Trafalgar is taking headaches away from agents by designating all Autumn/Winter/Spring packages, Hawaii tours and 9 of its multi-country ‘Discoveries’ itineraries as guaranteed departures. CostSaver Goes Dynamic: Trafalgar’s entry-level tours for the budget-conscious are no longer priced in the brochure. To help agents close the sale, they will be offered in three tiers of pricing, increasing closer to departure date. Required Registration: Similar to cruise line pax, Trafalgar guests will now be required to provide phone and email contact information prior to travel. Tollman says there’s a duty-of-care component to this decision, based on the increasing number of terror attacks and natural disasters. “We must have an ability to get in touch,” he says. “It’s a necessity, not a marketing ploy.” Tollman also says pre-trip direct communications will help personalize the experience, based on client needs and desires. He offers a personal vow to never convert an agent client to a direct-sell. “Never have, never will,” Tollman said. Is Trafalgar’s evolving approach to group vacations bearing fruit? Every global region saw double-digit sales increases in 2017, with Canada up a remarkable 19% year-over-year. Question answered.